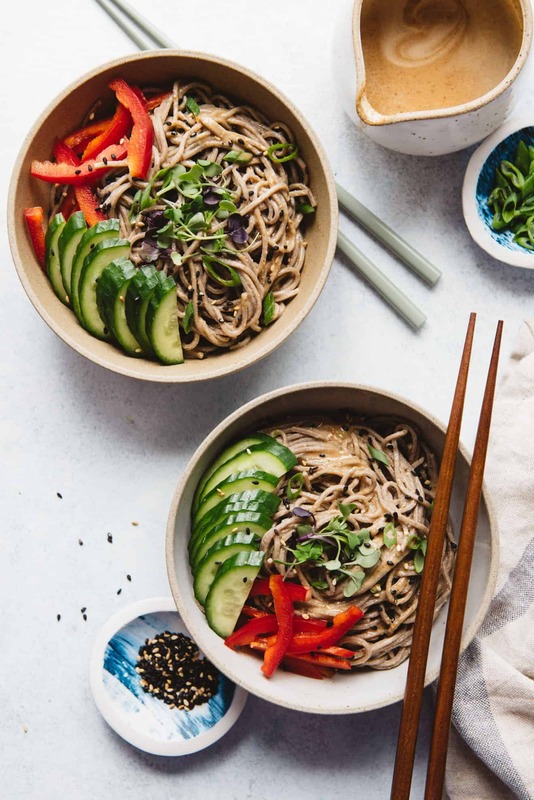 This soba noodles recipe is easy to prepare, and it is incredibly tasty. 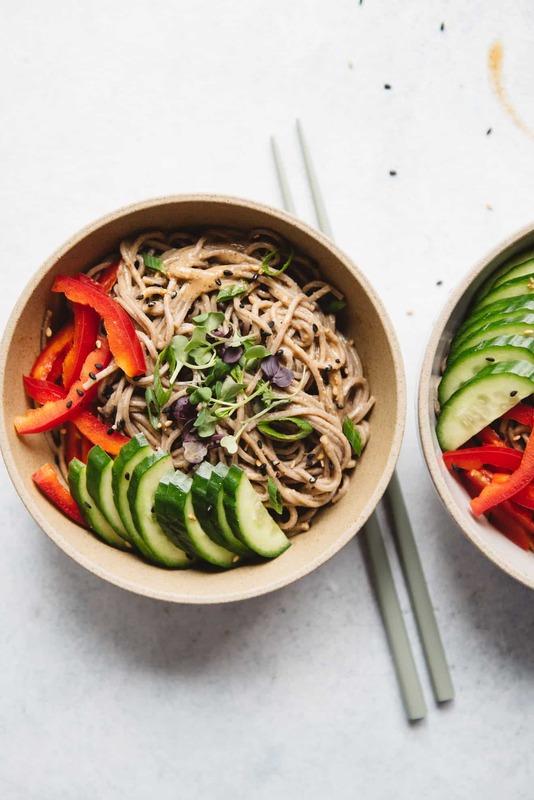 The noodles are tossed with a light almond butter sauce and served with sliced cucumbers, bell peppers, and scallions. Ready in just 20 minutes! In Japanese, soba means buckwheat, so soba noodles are made with buckwheat flour. If you’re buying soba noodles from the store, which is what I usually do, you’ll mostly likely see noodles that are made from a combination of wheat and buckwheat flour. They get the job done, but the important thing to note is that those noodles won’t be gluten free. Eden Foods is the only brand I’ve seen so far that produces a dried, 100% buckwheat soba noodles. 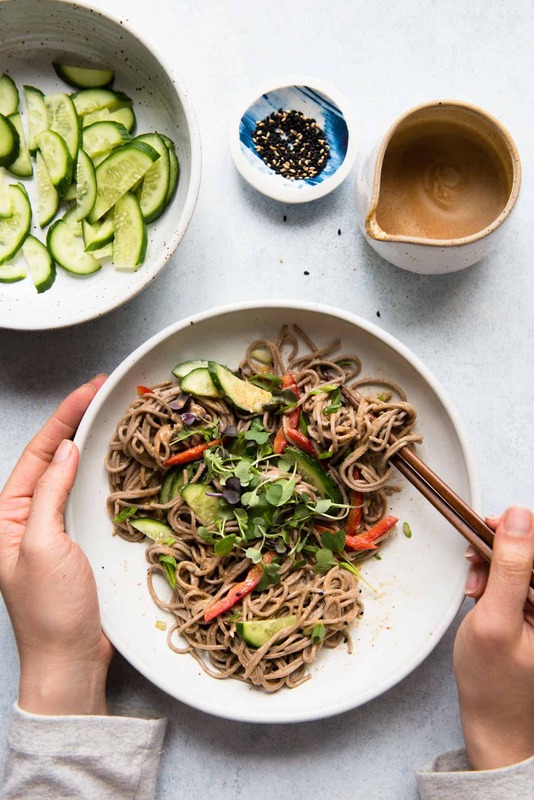 Buckwheat flour doesn’t contain gluten, but the Eden Foods soba noodles are produced in a facility that also processes foods that handles wheat. Soba noodles are great for weeknight meals because they cook very quickly—about 4 to 5 minutes in boiling water. 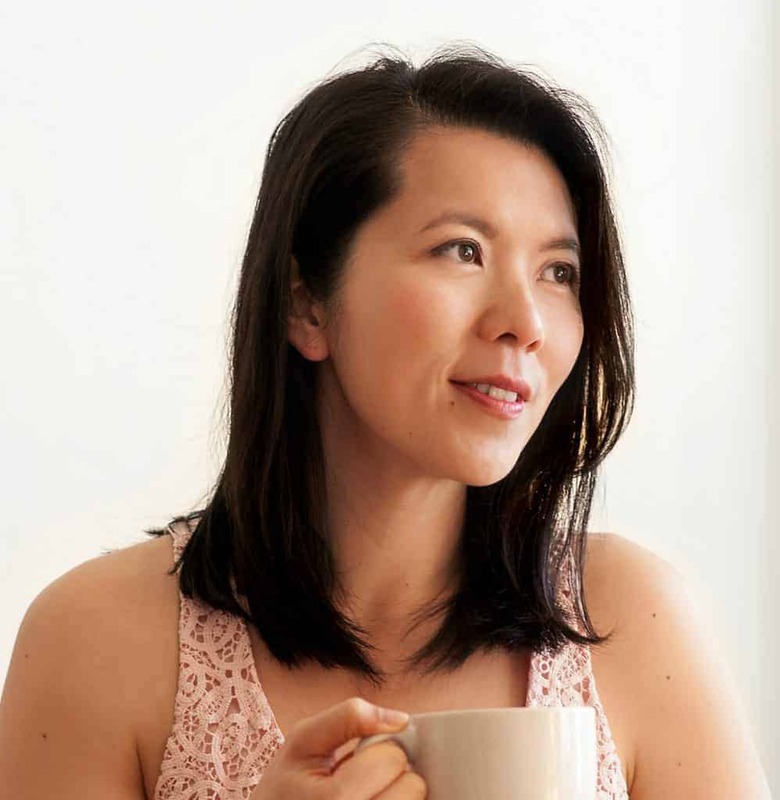 In this recipe, I’m flavoring the noodles with a sauce that’s made with a combination of almond butter, soy sauce, and a few other seasonings. It’s light and nutty with a hint of sweetness. If you don’t have almond butter, just substitute whatever nut or seed butter you have at home. The soba noodles recipe may look simple, but I promise that once you start eating them, you won’t be able to stop. 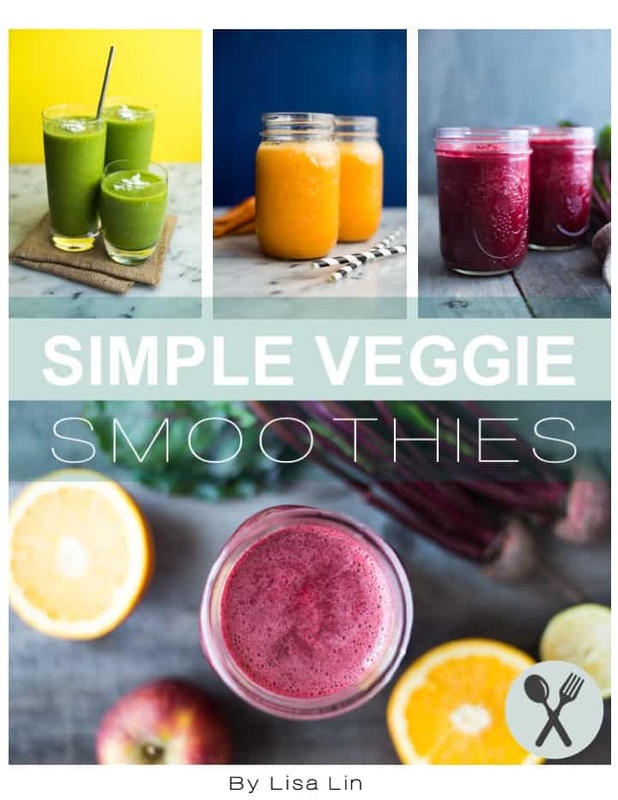 I ate this for lunch and dinner several days straight, and I wanted more! 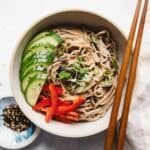 LOOKING FOR MORE VEGAN NOODLE RECIPES? If you prefer another nut/seed butter, feel free to use it instead of almond butter. However, avoid flavored nut/seed butters, such as coconut peanut butter or vanilla almond butter. These additional flavors will alter the taste of the dish significantly (perhaps not in a good way). Bring a pot of water to boil. Add the soba noodles and cook for about 4 to 5 minutes. Drain the noodles and rinse under cold water. In a bowl, mix the soy sauce, almond butter, rice vinegar, sugar, sesame oil, and onion powder (if using). If you have an immersion blender, use it! It will save you a lot of time. Transfer the ingredients to a jar, and blend the sauce with the immersion blender. Divide the noodles, cucumbers, peppers, and scallions into 2 bowls. This will make tossing the noodles a lot easier. Drizzle half of the sauce into each bowl. Toss everything together. Taste and add a pinch of salt to the noodles, if necessary. *Because the light green and white parts of scallions have a stronger raw bite, chop those parts more finely. Love this recipe. Delicious. By the way, Canada “sprung forward” to Daylight Savings Time last weekend as well.